Download Google Chrome 2.0.156.1 and enjoy the latest Web-Kit and a whole lot of new features, apart from several bug fixes. However you must subscribe to the Dev or Beta channel of Google Chrome to download this current version. 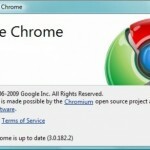 Update: Google chrome 2.0 is out of beta and you can download the Google Chrome 2.0 Offline Installer here. By default, everyone will have access to the stable channel when they first install Google Chrome. Thus what you download from Google Chrome’s homepage here is the stable version. But if you are one of those who would like to enjoy the latest features, then you can download the latest Google Chrome beta version by subscribing to the beta channel. But I wouldn’t recommend getting the Dev version by subscribing to the Dev channel, as it can be very unstable. How to subscribe to Google Chrome Beta channel? 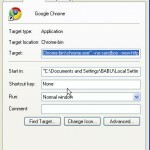 Next, download and run the Google Chrome Channel Changer. Check out the release notes for Google Chrome 2.0.156.1 here. Download and enjoy Google Chrome 2.0 from beta channel.